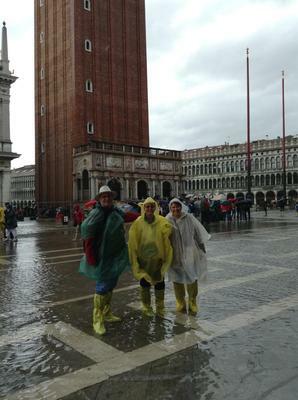 It started to rain as we approached the dock near St. Mark's Square. It also got a little gusty and many umbrellas were turned inside out. We had packed ponchos in our backpack, but the Square flooded to almost a foot in places, so we purchased some durable booties from a vendor. Talk about making lemonade when life gives you lemons, these vendors did a brisk trade in ponchos and booties. We didn't let it dampen our enthusiasm, however, and browsed the shops and eventually made our way to the Rialto Bridge, where the rain stopped and we had a delightful lunch under an awning along the Grand Canal and enjoyed the fascinating sights and sounds. It was the culmination of a 12-day cruise and it was certainly a trip we will never forget. The website: Mediterranean Cruise Ports Easy, was an invaluable help in the planning of this cruise, and we appreciate the legwork Ralph and Martina put into it. Hey, guys! I am sure that the weather doesn't matter anything if you have a good mood. No doubt your adventures was amazing. Thanks for taking the time out and sharing with us this interesting post. That's the spirit guys! Thank you for the wonderful story...it's a proof Venice is always fun!